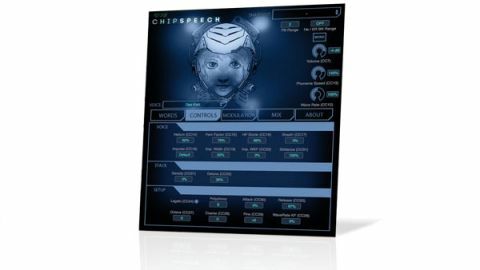 Clearly a labour of love, chipspeech is a powerful and polished product that's practically impossible to fault. Fantastic-sounding chipemulations. Loads of parameters to play with. English pronunciation is amazing. Phonetic mode is useful. Circuit Bending mode for insane sounds. Even speaks Japanese! Chipsounds developer Plogue's latest old-school endeavour recreates the sounds of a selection of primitive speech synthesis systems, turning them into musical instruments via MIDI input. Chipspeech works as both a standalone app and an instrument plugin (VST/AU/AAX/RTAS), enabling the user to create potentially very complex melodic or even chordal lyrical sequences in their DAW. "chipspeech is powerful and tons of fun to use, making it worthy of investigation"
Getting started is easy: load the instrument in your DAW and it'll sing back the default phrase ("All your base are belong to us"), advancing the cursor (playhead) one syllable with each successive MIDI note received. The pitch of the input controls the note at which Chipspeech 'sings', with legato notes continuing the sustain phase of the syllable, making it a snap to unleash your inner Roger Troutman with talkbox-style effects. The synth can also be switched to polyphonic mode, in which legato notes trigger the current syllable from the start, creating a sort of robotic barbershop quartet. Once the novelty of messing around with the default phrase has worn off, it's time to enter your own text. Chipspeech has 128 slots for lines of text (each of which can comprise 128 syllables), and once a line has finished playing back, the synth switches to the next one automatically. Lines can be set to loop (MIDI CC79) and selected manually (CC02). The easiest way to retrigger a line from the start, though, is to use the notes in the bottom two octaves, which put the cursor at the beginning of the first 24 lines. The software interprets English text typed into the text box using the CMU Pronouncing Dictionary, and it works brilliantly for the most part. Trickier words can be typed phonetically by switching to X-SAMPA mode, and there's even limited support for hiragana and katakana (types of Japanese syllable). Chipspeech's synthesis engine is similarly impressive, with eight emulations offering familiar voices such as the DECtalk, an IBM 704 vocoder combo (HAL from 2001), a Votrax SC-01 voice (as heard in Midway's Gorf) and regular and HD versions of the TI-99/4A-based voice from the Texas Instruments game Parsec. There are also Three "Circuit Bending" modes. Control, Modulation and Mix pages provide a wealth of controls for fine-tuning the sound of each engine, and there's plenty of scope for creating weird and wonderful voices, and tweaking them for maximum intelligibility. Chipspeech is powerful and tons of fun to use, making it worthy of investigation for anyone with even a passing interest in speech synthesis. The results it produces are great, and we predict that its robot tones will be a big hit with computer musicians searching for a unique new way to create their own electronic vocals.